This is the longest and most remote route to Kilimanjaro. After beautiful forests and moorlands it crosses the Shira Plateau to meet up with the Machame Route. Groups may be accompanied on the first day by an armed ranger as the forests around the Lemosho Glades are rich in buffalo, elephant and other game. The South Circuit is then followed, offering superb views of the Southern Icefields, past the Barranco Hut then on to Barafu and hence the summit. Descent is by the Mweka Route. A party wishing to ascend slowly can comfortably take 8 days on this route as described below. However the campsite at Shira Hut and at Karanga Valley could be left out by a very strong party on request. Accommodation on the mountain is in tents which the porters will pitch for you. You will need a sleeping bag, warm clothes and walking poles. This is a steep, tough trek within the limits of a fit individual used to walking in mountain areas. The Lemosho Route: is an unspoilt, remote, little used and beautiful way up to the Shira Plateau. It can either be used to gain the Western Breach route or followed by the Kibo South Circuit to ascend by the easier Barafu Route. The route is one of the few where groups may be accompanied on the first day by an armed ranger, as the forests around the Lemosho Glades are rich in buffalo, elephant and other big game animals. On arrival at Kilimanjaro Airport, met and assisted. Transfer to a hotel for an overnight. Dinner and Overnight. Shira Camp.Your day starts early with a briefing, followed by breakfast and a 2-hour drive from Moshi (910m) to Londorossi Park Gate (2100m). The guides and porters prepare and pack the supplies and your equipment in the village. You will receive a lunch pack and you can also buy mineral water in the village. From here a forest track requiring a 4WD vehicle leads to Lemosho Glades (2100m, 11km, 45 minutes). You will have a lunch stop about half way and will reach the Machame camping area in the late afternoon. Walk along forest trails to Mti Mkubwa (big tree) campsite, (2750m, 3 hours). Your porters (arriving at the camp site long before you) will have your tent set up on your arrival. In the evening the porters will boil drinking and washing water and the cook will prepare dinner, before you retire to your tent for the night. Night temperatures can already drop to freezing point at this campsite. Lemosho Day 2You rise early at Mti Mkubwa camp and, after breakfast, you climb an hour or so to the top of the forest and then the trail gradually steepens and enters the giant heather moorland zone. Several streams are crossed. A gentle walk across the plateau leads to Shira 2-camp on moorland meadows next to a stream (3840m). By now you will be able to see, in an easterly direction, the Western Breach with its stunning glaciers. The porters will boil drinking and washing water, before serving dinner. The night at this exposed camp will even be colder than the previous night, with temperatures dropping to well below freezing. Enjoy dinner and overnight. Shira Camp.The route now turns east into a semi desert and rocky landscape surrounding Lava Tower, where you reach an altitude of 4630m after about a 5 hours walk. Lunch is served in a designated area before ascending the rocky scree path to Lava Tower (4630m). Definitely the toughest day so far. It is normally around this point, where for the first time, some climbers will start to feel symptoms of breathlessness, irritability and headaches. 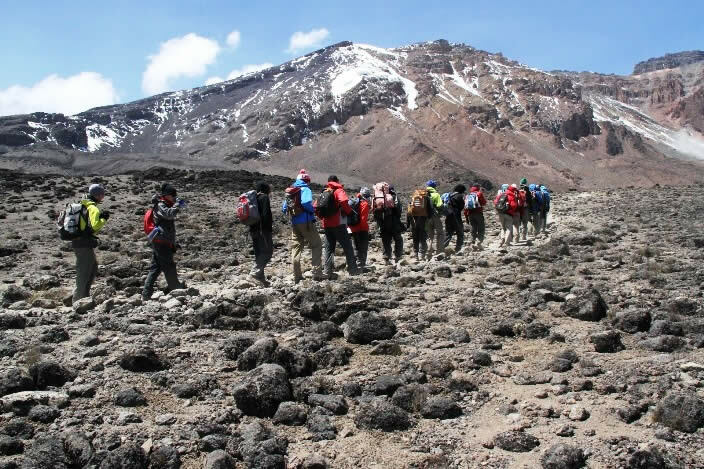 After lunch you descent again by almost 680m to the Barranco camping area and after reaching the high altitude of 4600m at Lava Tower, the true acclimatisation benefit of this day becomes clear.Shira Camp. This descent to Barranco camp takes about 2 hours and offers great opportunities to take some beautiful photographs of the Western Breach and Breach Wall. The camp is situated in a valley below the Breach and Great Barranco Wall, which should provide you with a memorable sunset while you wait for your dinner. After spending a night at the Great Barranco Wall (a very imposing sight at first), you make your way up this awesome looking obstacle, which in the end normally turns out to be easier than anticipated. Topping out just below the Heim Glacier, you now appreciate just how beautiful Kilimanjaro really is. The route then heads down through the Karanga Valley over intervening ridges and valleys, and then joins up with the Mweka route. Shira Camp.This is the preferred route down from the summit, so remember it. Turn left up the ridge and after another hour or so, you reach Barafu Hut. The last water stop on the route is the Karranga Valley, as there is no water at Barafu camp. Barafu is the Swahili word for “ice” and it is a bleak and inhospitable camping area to spend the night. Totally exposed to the ever-present gales the tents are pitched on a narrow, stony, and dangerous ridge. Make sure that you familiarise yourself with the terrain before dark to avoid any accidents. The summit is now a further 1345m up and you will make the final ascent the same night. Prepare your equipment, ski stick and thermal clothing for your summit attempt. This should include the replacement of your headlamp and camera batteries and make sure you have a spare set available as well. To prevent freezing it will be wise to carry your water in a thermal flask. Go to bed at round about 19h00 and try to get some precious rest and sleep. Lemosho Day 5You will rise around 23h30, and after some tea and biscuits you shuffle off into the night. You will head in a northwesterly direction and ascend through heavy scree towards Stella Point on the crater rim. This 6-hour walk to Stella point is for many climbers, mentally and physically the most challenging on the route. At Stella Point (5685m) you will stop for a short rest and will be rewarded with the most magnificent sunrise you are ever likely to see (weather permitting). From Stella Point you will normally encounter snow all the way on your 2-hour ascent to Uhuru Peak. The time you will spend on the summit will depend on the weather conditions. Do not stop here for too long, as it will be extremely difficult to start again due to cold and fatigue. Enjoy your accomplishment and a day to remember for the rest of your live. The walk back to Barafu from the summit, takes about 3 hours. Here you will have a well earned but short rest and collect the rest of your gear, before heading down to Mweka hut (3100m). The route is not difficult and will take you down the rock and scree path into the moorland and eventually into the forest. The camp is situated in the upper forest and mist or rain can be expected in the late afternoon. Dinner, and washing water will be prepared as well as drinking water. Transfer to Kilimanjaro Airport for your flight back home or continue with your safari schedule.